After quite some years of CD, music seems to have taken something of a backwards step, at least in terms of quality. If you bought a lot of CDs, you've probably heard how good they sound, and MP3 may be a bit of a disappointment as a result. Of course, most of the time, MP3s do a good job of giving us access to huge volumes of music, which is their value. But, the tide is changing. At the moment we're just starting to see lossless music and even "studio master" quality tracks being sold online. If you happen to love high quality audio, then this will likely appeal to you - and you'll need some way to listen to this music. Your computer might play high bitrate audio, but perhaps your Hi-Fi doesn't. 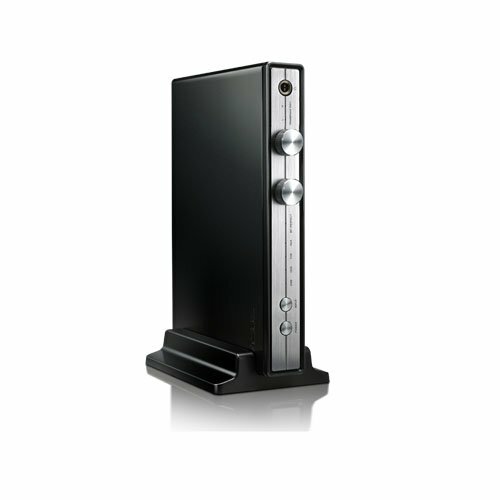 Whatever your needs the Asus Xonar Essence STU is designed to deliver really great quality music. How does it hold up? For computer users who want a much-improved quality of sound, including support for higher bitrates that give better than CD-quality sound, the Asus Xonar Essence STU offers its services as a sound card for laptop or desktop. From USB sources it's more than happy to accept 24bit/192KHz inputs. Connect your PC or Mac via USB and it will show as an audio device. From there you can use it as you would use any other soundcard. Your PC can send music to it, but you can also connect inputs from other devices that use digital RCA or optical jacks, or even a smartphone or tablet which can simply be used via the 3.5mm jack input. You can then choose to either listen through headphones - this is ideal if you have a decent pair - or pass the sound to an amplifier to listen through speakers. There's no amplification built in to the Asus, which does add to the cost of building it into a system by a significant amount. In audiophile circles the digital to analogue converter (DAC) has been a long-held tradition. When CD came along the purists - once they had finished saying they preferred vinyl - would buy their CD "transport" separate to the DAC. This meant that your hi-fi became lots of boxes. CD transport would be connected via digital cable to the DAC, which would decode the digits and pass them, via analogue RCA jacks or similar, to the amplifier. Most of us just used micro systems and were done with it. The truth is, the best solution lies somewhere in between how most people did things and how the high-end users did. Certainly though, decoding from digital to analogue needs to be done right, and that is what the Asus aims to do. To make the Xonar Essence STU work on a PC you need to install a simple driver, which takes a few minutes. You can get this from the Asus website, but without it you won't get the device to work as a soundcard, although you could send music to it via a digital connection. The Xonar Essence STU is really small. Just big enough for the front panel to feature a pair of volume controls - one for headphone output, another for the output to your amplifier. There's a small power button, and an input selector. There are also some status lights to let you know which input you're using. Aside from the volume controls, everything is small. Neither button is especially hard to press, though, and there's a little click from inside the machine that tells you it's switching on. There's a headphone jack that uses the larger 3/4-in connector too, so whatever headphones you might want to use with it is no problem. One problem we noticed after using the Xonar Essence for some time was a faint bit of interference that would repeat on a cycle. It was a sort of static sound, but one that repeated regularly. We had our review sample replaced with a new unit and the problem went away for a bit. Then we put a DECT home phone near the Xonar and the whole thing erupted with noise. So, what can we conclude? Well, things that send radiowaves are evil. In your home, there are things like homeplugs, microwaves, Wi-Fi routers and so forth that all blast out interference. But it's also an inevitable part of modern life. If you could see radiowaves, you'd see that the world is jam-packed with them. So we are a little disappointed that the Xonar wasn't better able to handle this particular interference better. Once we removed this source of noise, the Xonar went back to being brilliant, with no noise problems at all. Problems with interference aside, we quickly fell in love with the sound quality from the Xonar Essence STU. We used all our best headphones, from high-end Denons, through to Calvin Harris tuned Sol Republic studio cans and some Focal Classics. The results are very pleasing indeed. The quality of the sound produced here can't be disputed, and you'd have to spend a lot of money to get it on a hi-fi component. Via headphones you'll hear the cleanest possible sound. Only the way your headphones are designed and tuned will alter the sound you hear. Output to an amplifier is a much more complicated thing. We used two different amps during our test. The first was a very flat-sounding system that again added no tone of its own and left the sound as it was recorded. The second we had was a less audiophile-targeted system and it gave us a bit more control over the output. We like this neutral approach because the Asus gives the best possible quality which you can then tune to your ear with the rest of your equipment. Interestingly you get dual volume controls too, so you can adjust the output level via the rear-mounted RCA jacks, as well as the headphones. Usually, we'd prefer the RCA output to just be a "line" level, with no option to increase or decrease, but you do get this extra control here. It might be handy for some, who want to boost levels or reduce them to match their other equipment. The only problem is the dials are the same as one another, so you can sometimes get confused and adjust the wrong thing. At the back you can also flick a switch that allows you to boost the output to your headphones. This is really handy if you have cans that need a lot of power to drive them, as is the case with bigger home headphones sometimes. It's a nice feature, but be careful not to use it with smaller headphones. The noise issues on the Xonar Essence troubled us at first, but once we'd worked out the source of interference all was well. Do we expect this on audio equipment? No, not really. The issue is that Asus has gone for a smallish device, which is great, but with that you lose a bit of the shielding that makes high-end audio equipment much less susceptible to such things. There is also no way to ground the device, so if mains hum was a problem - it shouldn't be, as it's DC powered via a transformer - then you would be stuck with that too. But, when it comes down to it, wireless stuff can interference with a lot of other things, so keeping them away from the Asus is a must. When you do the sound quality of the Xonar Essence is fabulous. We've heard kit that costs a lot more and doesn't really sound any better. What you get delivered to your headphones is a clear and wonderfully flat sound. We paired it with three of our favourite headphones and all sounded brilliant. From our clean monitors through to our more bass-weighted everyday cans. For computer users - and that's really who this product is aimed at - this is a good route to getting fantastic quality audio. There are now some music streaming services that are offering music that makes buying into good audio hardware such as this Asus worthwhile. And most importantly, when you pair the Asus with a high-quality amp and speakers, the sound you get as a result is fantastic. It's not without some issues, but overall we've loved using the Asus Xonar Essence STU. It's become a key part of our home audio system, which largely revolves around the PC.